Sometimes I have trouble thinking of flavor text so we can share here. Share quotes and stuff you made up! Men often make up in rage what they lack in reason. The Dimir cursed the Orzhov for exposing secrets. 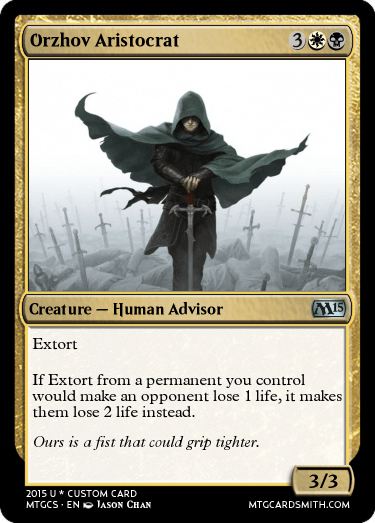 The Orzhov cursed the Rakdos for hurting profits. The Rakdos cursed the Dimir for quelling depravity. The Golgari cursed them all with the time to reconsider such trivial things. Ours is a fist that could grip tighter. "If this is the size of our forces, what are we expecting to defend against?" When a door closes, it usually stays closed. Balance is the illusion of control. No matter how bad you are, there's always someone worse. The endless eternities can be described by just one word: Creativity. "I'm just gonna poke it to make sure it's dead" -Bob's last words before his last scream. Bear with me, this list is long but it could've been longer. I grabbed what came to mind out of my cards first. Here we go! "Don't leave, the party's just getting started!" "Get your grimy claws off my friend!" "Come now, no matter how bad things may be, we should always make time for tea." When the time of snow is near, and its jingle bells that you hear, better head to your beds for the night, or Santa's zombie's will make sure to fill you with fright for staying up so late at night. He wanted to prove to the others that he was more useful than just organizing shiny sharp objects and fixing elfie smoothies at boggart brunches. may be Ravnicas last hope to withstand Nicol Bolas... Has it really come to this?" If brains were explosive, goblins would still have no problem with blowing their noses. "Last time I tried capturing this stuff, it singed my eyebrows!" Death is only part of the journey. "Guys look, Corwinnn's come to see us off at the prerelease!" "Where going to need more of these guys, Mortimer. Stop standing there and start searching before master catches you dawdling." Nibbles realized he had much to live for back home. "The asylum was supposed to be empty. My friends wanted an adventure, a scare. So they broke in. What they found made them think twice about what they had wished for." Dfndr always hated being called a coward. Surviving Innistrad requires good cardio. "There's no shame in not knowing, only in refusing to learn." Every giant loves a friend to smash things with. Imagine Surt's elation when he found out that his rage could create some. Its hunger is brought on by countless years in night-cloaked corridors, and nothing will keep it from food. Even you. "I have a client who wants to meets to meet you face-to-face. Fortunately, he didn't specify whether you should be alive for that or not." In his first assault on their stronghold, Warlord Kosan made the foolish mistake of not ordering his shield wall be backed by spearmen. Are you gonna finish eating that? This is fun, more people should drop flavor text here. you'll wish the lightning strike had killed you. soon finds he has none. Give a man a fish, and you can feed him for a day. / But give a fish a man, and you can feed it for a month. "The little girl walked into a dark, dark cave. The little girl met a dark, dark Beast. The little girl ate its dark, dark heart." Centuries of servitude, a day of glory, an eternity of death. Untrue by an inch, untrue by a mile. One who stands still's to tire most. Mind the paramount, manage the peripheral. "We've still got ten minutes until the Goblins come back..."
Is it a bird? Is it a griffin? No its a squirrel! An embodiment of the chaos of life. Be it winged or not, a dragon is still the perfect defence system. "Every day when given the choice, I'd rather be a statue of a demon than a tapestry of an angel." "The thing I enjoy the most is the first ray of sunlight in the morning, reflected by my shiny blade." yet many, what do you seek from the masses traveller?" It's nothing a little flatulence can't take care of. Im gonna drop off some quotes from inspirobot.me, a website that randomly generates quotes. Forcing an idiot to destroy a family member is probably just as valuable to the family member as it is to the idiot. Memorable Monkeys look at Regular Monkeys pass. Of course you are busy. Human existence is a freak show where the main attraction is confusion. This is for the guy who died in the lint mines! "You don't need to sell your soul in order to get promoted"
"Only when you learn to accept the destructive side of your demons, will you truly find companionship." "I found in myself what I sought in another. Just to find a much better lover! So I dined on all the fruits forbidden to man and found who I am." Close, but the answer is a trans woman. It's a tricky quote. Did you know I made that quote? It's my favorite.